With very attractive flowers Miltonia Orchids are a group that are on the rise. More hybrids becoming available and with long lasting flowers in a range of colours they great indoor plants. From high in the mountains os South America especially Brazil, some Miltonia have intricately pattered flowers they are sometimes called the Many Orchid as the flower does have a pansy shape. The individual species can be a little more difficult to grow than the hybrids. Reflowering is easy and they will flower when he bulb matures, rather than in a particular season. A good indicator of the correct amount of light is foliage colour, medium to light green foliage means the amount of light if correct, very dark foliage indicates lack of light. 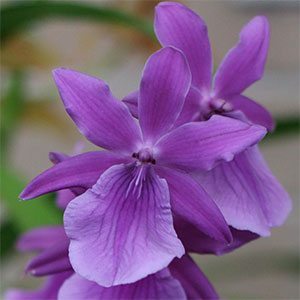 These are an orchid that do not like to dry out, lack of water is indicated by a shrivelling of the foliage or psuedo bulbs. So constant moisture and a 2 weekly flushing with clean water to remove any salt build up from fertiliser, Miltonia do not tolerate salt build up very well. Water temperature is also important, the water used should be allowed to reach room temperature before watering to prevent shock to root system. Humidity is also important, so a saucer with pebbles beneath the pot will help with humidity. Remember that the pot should not be touching the water. Intermediate to warm, so a good indoor plant. Most are hybrids 20C to 28C with some variation. Good ventilation is essential. You will need a cool period with temperatures around 15C (60F) for flowering to occur. Generally once a month with with a 50% solution of specialist orchid fertiliser. A high nitrogen fertiliser is best. Growing medium is usually a mixture of fine bark and sphagnum moss. The mixture needs to be adapted to your environment. More bark in humid environments, more sphagnum moss is hotter drier climates. They can also be grown as a mounted orchid however this is more difficult. Repotting should be carried out every 12 months. The best time to do this is when the new shoots just begin to show, usually in spring..
Miltonia Orchids are a fairly easy orchid to grow very similar to Oncidiums. Not to confused with Miltoniopsis which are a different species and these require a different temperature regime.